(Nanowerk News) Researchers at the Biomedical Research Institute of the National Institute of Advanced Industrial Science and Technology (AIST) and collaborators in Japan have developed microalga-based bioplastics mainly from constituents extracted from Euglena, a species of microalga. 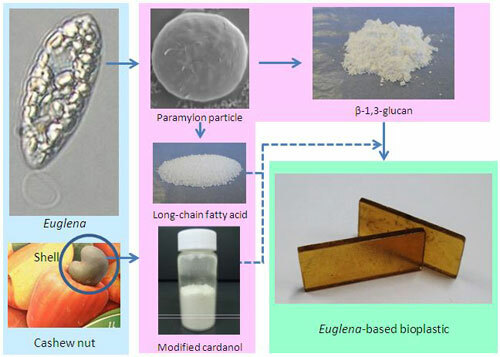 The microalga-based bioplastics were synthesized by introducing either a long-chain fatty acid obtained from a lipid (wax ester) derived from Euglena or a modified form of cardanol (a lipid derived from cashew nut shells that has both a flexible long-chain structure and a rigid hexagonal structure) to a polysaccharide (paramylon) produced by Euglena. Features of the bioplastics include high thermal plasticity and heat resistance as well as a plant component percentage as high as about 70%. This research has been conducted as part of the Advanced Low Carbon Technology Research and Development Program (ALCA) of the Japan Science and Technology Agency (JST). Production processes of microalga-based bioplastics from Euglena and cashew nut shells. With the growing sense of global warming crisis, increasing attention is being given to plant-based resources as alternatives to petroleum-based products. About 230 million tons of plastic is produced annually (about 13 million tons in Japan). Most plastics are produced by polymerizing petroleum-based monomers under high temperature and pressure conditions. Consequently, plastic production generates enormous amounts of greenhouse gases and uses tremendous amounts of energy. The use of plant-based alternatives to petroleum-based products involves the risk that terrestrial plants alone cannot meet the demand that is of the order of several tens of million tons. In addition, it is desirable that the feedstock used to produce the alternative plastics is inedible and thus does not compete with food crops. Regardless, the major issue—not only in the production of alga-based plastics but also in microorganism- and biocatalyst-based production technologies—is to improve the balance between energy used for production and energy saved. This research and development have been conducted as part of the research topic “Development of bioplastics using inedible polysaccharides” (Smart Energy Research Laboratory, NEC Corporation) under the ALCA program (FY2011-2016) commissioned by JST. The purpose of the research is to develop innovative bioplastics that use polysaccharides of steadily available, inedible plants such as cellulose and enable a large reduction in greenhouse gas emissions. To minimize the dependence on terrestrial plants as a source of polysaccharides and improve the functionality of bioplastics by diversifying the molecular structure of polysaccharides, the researchers have conducted the development of microalga-based bioplastics using a polysaccharide (paramylon) produced by Euglena as a main constituent. It is well known that microalgae generally have higher solar energy utilization efficiency than that of terrestrial plants. Among microalgae, it is notable that Euglena can directly use high concentrations of carbon dioxide and can achieve high light utilization efficiency. For these reasons, Euglena was selected as the source of raw material for bioplastics. In addition, Euglena can be cultured with industrial effluent from food-processing plants, and its use therefore should lead to the reduction in energy used to produce plastics. 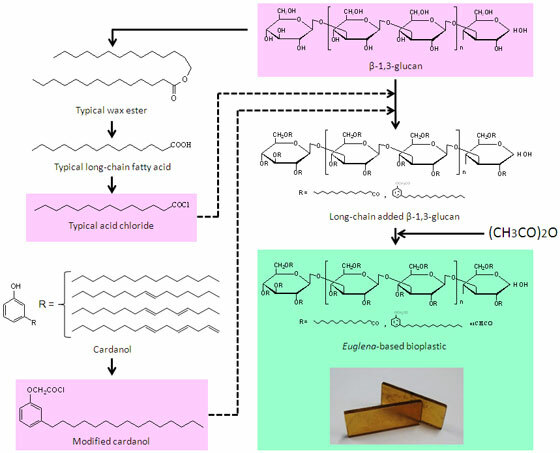 The developed microalga-based bioplastics were synthesized by adding a long-chain fatty acid synthesized from wax ester formed when paramylon (a polysaccharide produced in large quantities in Euglena cells) is decomposed in Euglena cells or modified cardanol synthesized from a lipid (cardanol) extracted from cashew nut shells to paramylon. Figure 1 shows the chemical formulae of the compounds and production processes of the bioplastics. The main raw material polysaccharide is β-1,3-glucan, a natural polymer consisting of glucose molecules. Cellulose (β-1,4-glucan), which is a constituent of trees, is also a polymer consisting of glucose molecules. 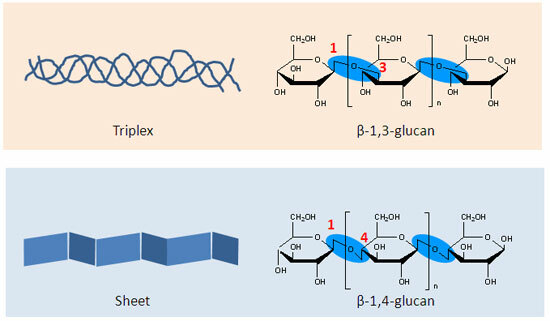 However, the glucose molecules in β-1,3- and β-1,4-glucans are linked in different ways: cellulose has a sheet-like structure, whereas β-1,3-glucan has a single- or triple-helix structure. Thus, there is a large difference in steric structure between the two glucans (Fig. 2). Figure 1: Production processes of the microalga-based bioplastics. Figure 2: Difference between β-1,3-glucan (paramylon) and β-1,4-glucan (cellulose). The properties of the developed microalga-based bioplastics were measured. Their impact strength needs to be improved, but their thermal plasticity is comparable to that of conventional bioplastics (polylactic acid and nylon 11), cellulose acetate with plasticizer, and petroleum-based ABS plastic. They have higher heat resistance than that of these plastics (Fig. 3). There is no significant difference in properties between the plastic with cardanoxy acetic acid and the plastic with wax ester-derived long-chain fatty acid. Figure 3: Comparison of heat resistance of microalga-based bioplastics and other plastics (Myristoyl group added β-1,3-glucan and cardanoxy acetic acid added β-1,3-glucan are microalga-based bioplastics). The researchers will elucidate the detailed relationship between the properties and structure of the microalga-based plastics and will advance molecular design aiming at commercially applicable properties such as high heat resistance and high strength. Also, they will study the technologies required to produce microalga-based plastics, including processes for efficient culture of Euglena and extraction of paramylon.